Lightning is one of Earth’s most magical and powerful natural phenomenons. But is it possible to capture it? Well apparently the answer is yes, and all you need is some perspex and a hammer and nail……and a machine that generates 3 million volts. 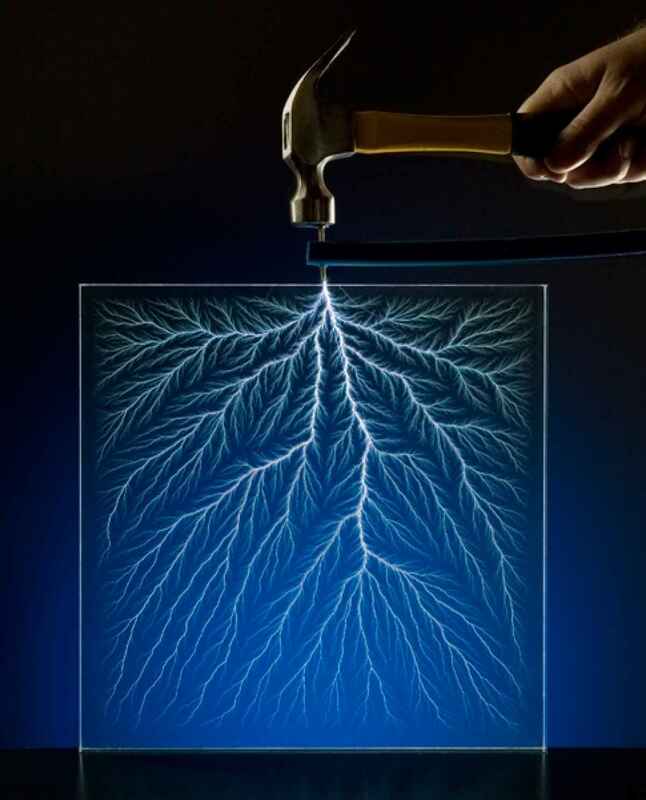 This art of frozen lightning permanently captured in an acrylic block, was created at the Kent State Neo Beam facility in N. America, using a dynamitron. A dynamitron is particle accelerator that uses magnets and high voltages to blast electrons – in this case into the acrylic block. The plastic being a good insulator traps the electrons inside – now all you need is to hammer a nail into the block to release the electrons. As the high charge leaves the block it heats the plastic – creating the distinctive pattern, known as a Lichtenberg figure.